This elaborate Altar of the Kings (Altar de los Reyes) was created for, and still stands in the Cathedral of Mexico City. It is peopled by figures of rulers, both carved and painted, who were canonized by the Catholic Church, and thus depicts the supreme union of the political and religious spheres. The work stretches from floor to ceiling, measuring 25 meters in height, 13 meters in width (ca. 82 feet tall, and 43 across). The exuberant style of fine sculpture was prized in New Spain’s cosmopolitan centers in the 18th century. Both paintings and sculptures were commissioned from some of the best-known artists of the day. At the top of this dramatic altar, God the Father, holding an orb and wearing a red cloak, hovers over the whole ensemble. He appears on the top of the central axis while at the base, a gilded figure of Jesus of the Sacred Heart is set. The two paintings on this axis are the Assumption of the Virgin, above, and The Adoration of the Magi of 1719, below, which measures ca. 500 x 250 cm. Both were the work of Juan Rodríguez Juárez. Rodríguez Juárez belongs to a family of famous Mexican painters. Works by his father and brother are also in Vistas, as is Juan’s portrait of Viceroy Duque de Linares. The detached columns of the altar have a distinctive geometric form: wider towards the middle, narrow at the top and bottom. They are known as estípitecolumns and became characteristic of 18th-century architecture in New Spain, after having been first introduced from Europe. Since this Altar of the Kings was dedicated to sainted monarchs, its iconography follows suit. On outer part of the first tier, where the Adoration is set, San Fernando, King of Castile and Leon (r. 1217-1252) at left, looks across to St. Louis, King of France (r. 1226-1270). The two monarchs, both of whom took up the sword to defend Christendom from Muslims, are often paired in such altars. The gilding of the altar has been restored. In the 18th century, when the original gold leaf was applied, thousands of hours of labor were required (as did its restoration). 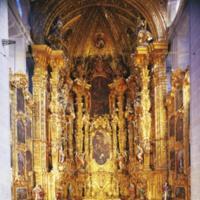 The project was overseen, from 1725-1736, by a master painter and gilder, Francisco Martínez. Jerónimo de Balbás designed the Altar de los Reyes. He came to Mexico from Seville and brought with him experience in church commissions (he designed the principal retable (retablo) for the Cathedral in Seville). For the metropolitan cathedral in Mexico City, Balbás also designed the Altar of Pardons (Altar de Perdón) and oversaw the installation of the choir screen. He also worked on other building projects–both as architect and retablo-designer—in Mexico City across the first half of the 18th century. This composite work required a multitude of materials: oil and canvas for the paintings, wood, gesso and polychrome paint for the sculptures and estípitecolumns, and much gold leaf. Overseen by master painters, carvers and gilders, most of the work was actually done by hundreds of hands working thousands of hours. The whole project took almost 20 years to complete. The Altar of the Kings occupies the Chapel of the Kings, in the apse of the Cathedral of Mexico City. It is still a focus of worship. In the 18th century, other such Altars of Kings also graced other cathedrals in Mexico, including one in Puebla. This famous retablo represents the fusion of high art and high religious expression. 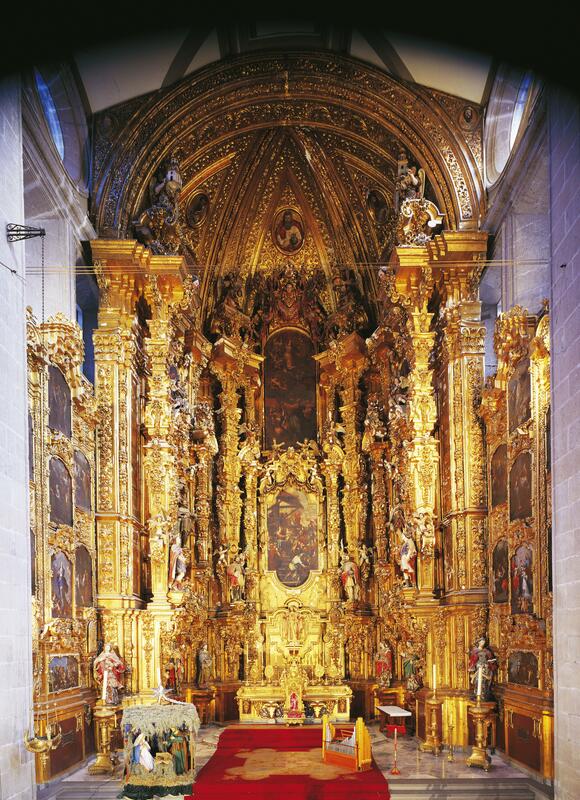 Installed in the preeminent Cathedral of New Spain (and now, of the nation of Mexico), the Altar of Kings shows how, in urban centers, the official state religion of Spanish America, Catholicism, was sustained by, and in turn itself sponsored, creations of great artfulness. The Altar also makes clear how public expressions of faith in 18th-century Mexico City depended upon investments of extraordinary wealth. Banco Mexicano de Imágenes. Used by permission of the Instituto Nacional de Antropología e Historia, Mexico; all rights reserved. Catedrals de México. 1993. Mexico City: CVS Publicaciones. Early, James. 1994. The Colonial Architecture of Mexico. Albuquerque: University of New Mexico Press. Fernández, Justino. 1959. “El retablo de los Reyes: Estética del arte de la Nueva España.” In Estética del Arte Mexicano. Mexico City: Universidad Nacional Autónoma de México, Instituto de Investigaciones Estéticas. Tovar de Teresa, Guillermo and Jaime Ortiz Lajous. 1985. Catedral de México. Retablo de los Reyes. Mexico City: SEDUE.